At the moment it feels like 90% of the blogging community is chatting about the return of the great british bake off and after being addicted last year I couldn't wait for it to return. A few weeks go I heard about #thegreatbloggerbakeoff - great idea huh? You can imagine my excitement when I discovered that this weeks theme (biscuits) tied in with something I was planning to bake anyway. I'm not going to put a baking post up every week for the whole series though - just when I feel inspired. 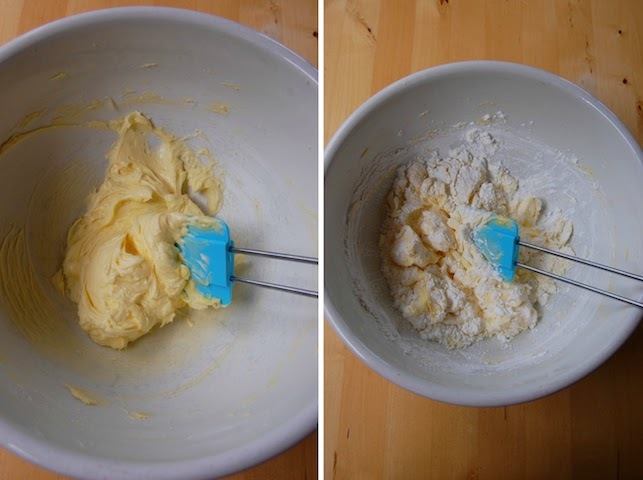 Firstly (as ever) cream together the butter and sugar until smooth and creamy. You should then sift the flour into the creamed mixture and beat until well combined. Adding all that flour took a little work but eventually the dough was good and smooth. You should then roll up the dough into teaspoon sized balls - trying to keep them all equal and placing them onto a baking tray. The dough should still be very soft so if it is sticking and difficult to handle hopefully coating your hands with flour should help. I then went and flattened all the dough balls with the back of a fork. After pre-heating the oven at 170°C I baked them in the oven for about 15 minutes until they were lightly goldened. Once baked place them on a wire rack to cool completely. Firstly beat the butter until very soft and creamy - I used electric beaters otherwise it would of been a tough job. I then gradually added the sugar continuing to beat until smooth. Add the passionfruit and again beat until well combined. I always remember my aunty stores the biscuits and cream filling separately and then just makes them up when she is going to serve them. I can see why she does this because they were a little messy to get into the box but for the want of blog pictures I made all mine up straight away. So there you go - my first bake for the #thegreatbloggerbakeoff. Check out the hashtag on twitter to see what everyone else has been baking. Sadly Wednesday is Scott and Is date night so I won't be watching the bake off tonight but will catch up with iplayer later this week. No spoilers please! If you've enjoyed this baking post please give my baking board a like on pinterest. Its a great way to keep them all in one place. These look delicious!! I can't wait to make some! Ohmygosh these look amazing Claire! I LOVE passion fruit! Recipe saved into my recipe photos. I'll get onto Pinterest ASAP too! These look incredible! I love the idea of passionfruit buttercream - a lot of the time I think buttercream icing is too sweet so the sharp passionfruit would be the best compliment. I need to go stalk your baking board now!